Learn more about us below or contact us to schedule a tour. 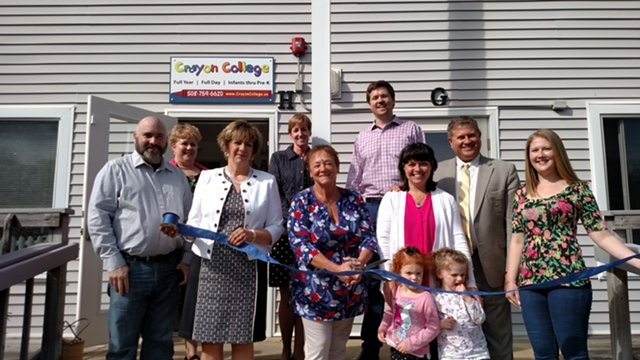 Lucinda Morgan owns Crayon College, a full day childcare program with 3 locations, Kingston, Plymouth and Bourne. She began her career as a Kindergarten teacher transitioning into the role of director in her early 20’s. She eventually became a regional director for a large corporation, overseeing multiple centers. As Cindy gained experience and business knowledge, she realized she missed the intimacy of smaller centers. That’s where her dream of Crayon College started. With her husband’s support she opened the first Crayon College in Kingston in 2004. The second location in Plymouth opened its doors in 2007. Bourne is the newest location, that opened in 2016. Cindy’s philosophy is very simple, children thrive where they feel safe and loved. In each of the three centers Cindy invests as much time in her teachers as she does with the children and families. Crayon College teachers are encouraged to grow and gain experience. All of the classrooms are designed to promote child based learning experiences. Teachers design age appropriate curriculum that fosters growth and development. Crayon College believes that children learn and develop best when in a secure, loving environment. Since we are concerned with the whole child, we aim to balance their development in all areas: social, emotional, physical and intellectual. Our teachers are dedicated to helping children grow at their natural pace by building their self-confidence, strengths and skills. Simply stated, the philosophy of Crayon College is to provide high quality, safe, secure care and learning experiences for children in a positive atmosphere. Maintaining a non-competetive, non-judgmental atmosphere in which children develop a positive self-image. Helping young children to develop interpersonal relationships with peers and adults that are founded on sharing, trust and mutual respect. Promoting a partnership between home and school. Challenging each child to reach his/her potential and take pride in his/her accomplishments. The opportunity to fulfill the human potential in all children. That the physical and emotional health and safety of all our children are our highest priorities. The the work of the child is growth through play. That the provision of professionally trained teachers who adhere to the principle of promoting positive self-esteem is essential to providing a growth environment. That each child is an individual with unique and valuable characteristics who should be encouraged to progress at his/her own pace. Learn about our schedule and fees here.